They come in cute mini-sized bottles. Great for the summer holidays because they're so compact you can bring all your favourite shades along with you. And at only $4 each.. you can experiment with MORE colours. The colours are bright, vibrant and quick drying. 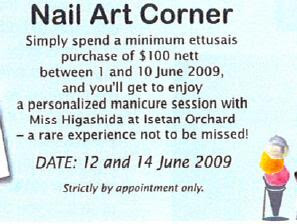 Great for nail art! Glitter is so easy to use! For the base- I used one coat of Frozen Yoghurt (no.3). Then I painted a light coat of glitter Argent(no.15) over it. After about a minute, I used Argent again but this time I only painted on the outer right corner of the nail. This gives a gradation effect. And this design is - Candy Jazz I used one coat of Frozen Yoghurt (no.3) for the base. Then I painted top-left corner and bottom right corner of the nail with Strawberry Milk (no.4), leaving a strip of the Frozen Yoghurt showing. And on that middle stripe, I jazzed it up with a diagonal stroke of Argent(no.15). The easiest but most fun- More Sprinkles Please Frozen Yoghurt as the base, and then colours of your choice as sprinkles! All you need to do is dot them on (i use the back of a paintbrush, but anything with a point on it will do). I used Blue hawaii (9), wild cherry (11) and Rich Banana (8). I'm flying off this evening... but I'll post on SFactor before I leave...(sorry.. have not had the time yet....will probably write it at the airport while waiting). awaiting for your sfactor post wahaha!! but the sprinkles one CMI. so ugly lah! Thnx for the info on the nails workshop.. I need to learn how to do. yap looking forward to ur S factor post. btw those "ice-cream" look so yummy lol! I first watched S Factor 2 wks back on Youtube and I liked u immediately (compared to the rest of the contestants). Haha. Thought u were the wisest and most decent out of the rest. Anyway those are pretty nails (last 1 looked funny though, with the sprinkles).